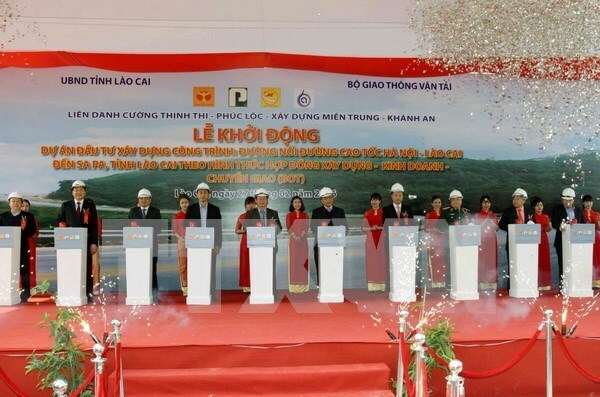 Lao Cai (VNA) – Deputy Prime Minister Nguyen Xuan Phuc pressed a button to launch a project to connect the Noi Bai-Lao Cai expressway with touristy Sa Pa town in northern Lao Cai province on February 27. At a cost of over 2.5 trillion VND (112.5 million USD), the project will build a four-lane provincial road crossing Sa Pa and Bat Xat district and Lao Cai city and upgrade existing highway 4D. The work on overall 29.2 kilometres of road is expected to finish within the first quarter of 2019. At the ceremony, Deputy Prime Minister Phuc said he supports the project’s build-operate-transfer (BOT) model and coordination among different constructors. Highway 4D plays a significant role in the development of the northwestern region. However, the road is relatively small and easily blocked by heavy traffic.